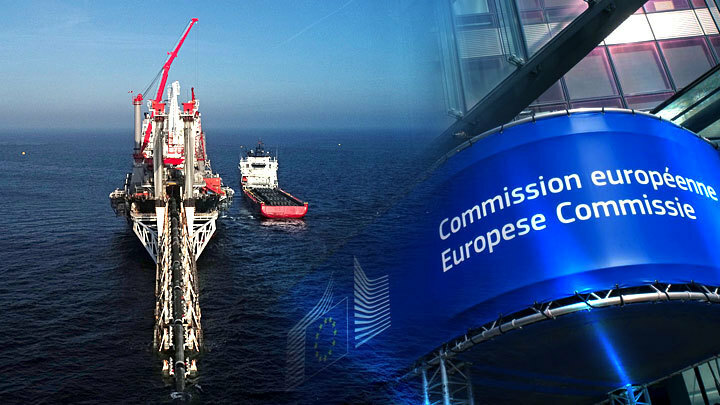 Home » Germany entered the fray with the European Commission for the "Nord Stream-2"
The construction project of the Russian gas pipeline "Nord Stream-2" remains the subject of serious disagreement in Europe. After Germany, because of its own economic benefits, took a tough stance in support of the project, Berlin ran into bitter opposition from the United States, several European countries, the European Council and the European Commission. Meanwhile, the project continues, as most European countries, in whose economic waters are pipe-laying, have given their consent. However, Brussels does not intend to simply give up and under pressure from Washington continues to come up with various ways to harm the gas pipeline, sabotage its construction or make operating conditions unprofitable. The next report of the European Commission pursues just such a goal. To create problems invented a special legislative mechanism. The subordination of the gas pipeline to this European law will hit Germany’s interests, so it is not surprising that the confrontation between Moscow and Washington turned into a local European conflict of interests, in which Finland and the Netherlands also took the side of Berlin. What exactly does Brussels want to do? It is known that the main beneficiary of the breakdown of the construction of Nord Stream-2 is the United States. American President Donald Trump, even during his election campaign two years ago, promised to make the country a global energy leader. This task today has one major obstacle - Nord Stream 2, which is designed to increase the supply of Russian gas to Europe. The United States, by contrast, assumed to close the growing needs of European countries through the supply of its liquefied natural gas (LNG). The paradox is that the American liquefied gas is three times more expensive for Europeans than the Russian pipeline. That is why the project is so beneficial primarily to Germany. If an additional 55 billion cubic meters of gas a year goes to Europe through the new Russian pipe, the effect for Europe will be extremely positive: the needs of consumers will be satisfied, and the overall cost of gas on the European market will decline. Under these conditions, the American LNG from relatively unnecessary gas for Europe will turn into completely unnecessary, and it will be impossible to sell it at all. In order to sabotage the Nord Stream II, Washington calls it a political project that will become an obedient lever in the pressure on Europe from Russia. Berlin, however, insists on its commercial value. The only trouble is that, to the detriment of their own position, the United States is supported by the countries of Eastern Europe, it stands in solidarity with Washington and Southern Europe, on whose territory LNG terminals are built. Therefore, the European Commission (EC) has chosen the only possible way to prevent Moscow and Berlin from resorting to the voices of far from the largest European countries in order to “kill” the project and harm the economic interests of such a giant as Germany. The European legislative framework has become a new and perhaps the latest pressure mechanism. Why impose sanctions on the gas pipeline and those who will use it, if it is possible to simply limit the project at the level of the law, reduce its potential, harm the consumers and deprive it of its economic advantage? More recently, the US ambassador to Germany, Richard Grenello, warned of future troubles for the gas pipeline and European consumers of Russian gas. The ambassador did the main thing - he sowed discord in Europe, and now the European Commission has taken this path. According to Vedomosti, on the eve of the EU countries responded to the third revision of the amendments to one of Europe’s main energy laws - the gas directive. The EC insists that the amendments be adopted. They involve the redistribution of regulation of the European market in order to extend it to the offshore gas pipelines. The law separates the functions of the transit and supplier, and allows third-party deliveries to develop competition. The most important thing is that the European Commission should get the right to control interstate agreements on gas transportation, as well as block them if it wishes. What does it mean? First of all, a powerful blow to the Nord Stream II, its essence, purpose and effectiveness. Another consequence is the equalization of the legal status of underwater and land gas pipelines in Europe, that is, the transfer of the Nord Stream 2 to the control of the European Union. The directive notes that if the gas goes through Europe and will be distributed through its gas transmission system, then the entire volume of the required control and at the sea stage - in the depths of the Nord Stream-2. It will be integrated into the overall system and supposedly will become a tool for competition among European suppliers. With the intention of the EC to correct the European gas directive they did not agree in Berlin, Amsterdam and Helsinki. The updated document will be a blow to the interests of a large industry German business - Wintershall, Uniper, Austrian OMV. The rest of the European companies tied in one way or another to Nord Stream-2, the French Engie and the British-Dutch Shell, will definitely not support the document. It is these factors that give Berlin the full right and reason to call the gas pipeline a commercial project. At the same time, Germany as a whole has no objections to the regulation of the GTS, which connects Europe with third countries. According to sources, the position of Germany was also supported by the Netherlands and Finland. They noted in their resolutions that they did not see the point in adopting new amendments, since the EU gas directive in its current form already sufficiently regulates the European gas arteries. In general, it is absolutely clear that the initiative to make changes in the European gas directive does not at all pursue the goal of achieving transparency, competition and other benefits of a market economy in the gas sector. In Berlin, they are well aware that they will lose if they lose the right to be Russia's main partner in Nord Stream 2, sharing sovereignty this time not with the US, which the Germans were inclined to do before, but with the EC and Washington's allies in Europe. That is why Russia's key partners in this project, as well as the lobby of large businesses that have invested in the gas pipeline, are unlikely to pass Nord Stream 2. However, Brussels’s attempts to block the project or individual agreements within its framework cannot be ruled out, which in fact contradicts common sense. In favor of Washington, the Europeans agree to deprive themselves of cheaper gas, which is almost ready to go to the European market in order to ensure the EU’s energy stability and relieve the dependence on the transit country represented by unreliable Ukraine.